I can’t seem to calibrate this thing to work properly. I know you are supposed to to wait until there isn’t any active insulin or when there aren’t huge drops or spikes. The problem is that I am always snacking on many small meals during the day, so there is ALWAYS active insulin. My other problem is the low blood sugars – which force me to eat and rebound making calibration impossible. This makes it hard to see what my blood sugars actually are. When this photo was taken, my blood sugars via fingerstick had already dropped to 206 mg/dl. Not ideal, but most certainly not nearly 300 and rising. I’m finding that the CGM is two steps behind or one step ahead. If I treat a low, my blood sugar starts to rise within twenty minutes. However, I still end up fighting alarms for the next 30 minutes. I’ve also seen steady lines in the 130 range for a number of hours, while my fingersticks say I’m 177 or higher. HUGE discrepancy. The low blood sugar alarms woke me up at least 5 times last night, which isn’t something I want to happen when “springing forward.” My sensor alarmed nearly every half hour for 3 hours straight. I treated non-lows at least twice to get it to shut up. (The lowest my meter recorded was 77… while my sensor said 58.) I woke up to a 155 vs. 123 discrepancy again. I know I can safely maintain the sensor in for 6 days. I’m about ready to chuck this sensor and start over. This isn’t what I wanted. What am I doing wrong y’all? Oh no! I am so sorry you are having trouble with this thing? What made you switch over to the meter? I’ve had type 1 for three years now and I never wanted to go on that thing. I’m sure there is an adjustment period. It’ll all work out! I haven’t switched… Just “enhanced.” 🙂 Of course, these weren’t the results I was looking for. I’m sure that whenever the sensor cooperates, it’ll be a great tool to help control my sugars. I’ve heard to calibrate when you have no arrows, but no active insulin? That’s a new one! I’ve calibrated when I test just before meals (and bolus immediately after), and it sort-of-works. Calibration is a tricky thing to master… especially when you’re forced to METER BG NOW and you’re not quite stable enough to do it. Once before meals (breakfast, lunch, dinner) should suffice for calibrations — I’ve learned NOT to try to “nudge” it in the right direction if it’s a little off. In the book “Beyond Fingersticks”, author Wil Dubois equates calibrating to putting numbers next to the lines on a thermometer. As I interpret it, the more small “nudge” calibrations you do, the more you throw off the more extreme BG’s. If you tell it that what it “thinks” is a 115 is really a 100 (it’s estimating 15% too high), then it will change it’s estimation of a 300 to be a 255 (15% less). Or something like that. 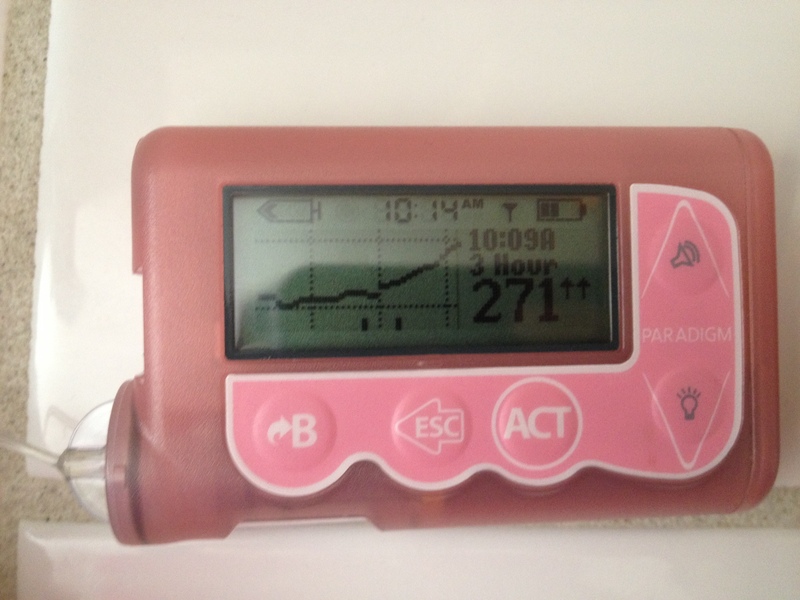 I’ve found that, the first six hours of a Medtronic sensor (beyond the initial two) aren’t too useful. The ISIG value (what it measures, then mathematically converts to BG) starts out high, so your initial readings will be much higher than they really are. After the sensor has time to “marinate”, it’s more accurate. Some people insert a new sensor at night but don’t “Start” it (via the pump) until the morning. Others, like me, will start the sensor when ready (to avoid being completely blind), but then a few hours later, will start it again (“New Sensor” menu option) with a new initial value. That’s what I did this morning…. If you have any questions about it, feel free to ask. When I used the Medtronic sensors, the teaching nurse recommended putting the sensor in at night and calibrating first thing in the morning (like Scott said…). Even then, the readings were never *quite* right. It kept missing lows for me, which was the primary reason for using them. I thought about doing that last night. But I kinda wanted a night off.